City of Bogo: New Bogo City Hall is now open! New Bogo City Hall is now open! New Bogo Business District, Buac, Cayang, Bogo City, Cebu. The New Bogo City Hall is now open for business. Yes, the Local Government of the City of Bogo is now operating in the New Bogo City Hall, sitting at a 6-hectare lot donated by Sra. Nilda Espinosa Martinez and Mr. Robie Hererra. The said area is in the middle of more than a hundred hectare of flat lands planted with sugar cane and now being converted into a new commercial district. Many companies, entities and business groups are now showing interest already to invest and put up business establishments in the area. The first ever to own lot and will soon start constructing a mall is the Robinsons Land, Inc.
Around the New City Hall will also rise more buildings that will house most, if not all service-oriented Government Agencies that will serve not only the people of Bogo and the neighboring towns, but also the neighboring provinces of Masbate and Leyte. This project is aimed at boosting economic activities in the City of Bogo and its neighboring towns. Mayor Junie Martinez started this project in 2009. Construction was stopped sometime in 2010 due to the flip-flopping of the Supreme Court decision on Bogo's cityhood status and 15 other LGUs. 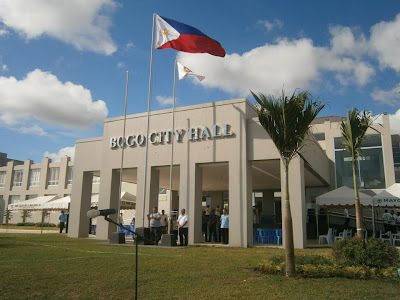 Starting last Monday, April 15, 2013, the New City Hall is now serving the people of Bogo. For inquiries, you can call the New City Hall at (032) 260-5310, 260-5311 and 260-5312. Then ask the operator to connect you to the Office that you wish to call. Last April 16, 2013, Tuesday, the New Bogo City Hall was blessed followed by the Holy Mass officiated by Msgr. Isidro "Dhodong" Ullamot, Fr. Dave Jurcales, Fr. Jermaine Lecciones, Fr. Maning Tan, and a newly assigned priest in Bogo. The Inauguration will be on April 19, 2013 by no less than HIS EXCELLENCY BENIGNO S. AQUINO III, President of the Republic of the Philippines. Please like also the New Bogo City Hall's Facebook page at https://www.facebook.com/NewBogoCityHall. Photo courtesy of Eden Tagalog Diaz.